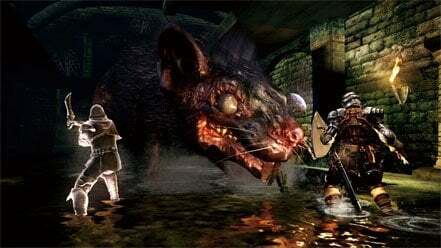 Giant Rat is a Mini-Boss in Dark Souls. The Giant Rat that has an axe lodged in its left eye, from an earlier encounter, and is located in the first large antechamber in the Depths. It guards the area with the Sewer Chamber Key, and the slide-shortcut to the Blighttown entrance. The Spider Shield can also be found on a ledge above, accessible from the shaft behind the Butcher. While the overgrown Mickey is susceptible to fire and lightning damage, it can and will inflict poison with each of its attacks. So favor rolling and evading, over blocking. It's most painful attack, a quick head attack that deals decent damage, and inflicts poison. The Giant Rat bites you, dealing average damage, and inflicts poison. The Giant Rat swings its paw to scratch you, inflicting decent damage and poison. This Rat is fast and hits hard, but luckily there are escape routes which allows for safe replenishment of Estus. There's no real strategy to employ here, other than hit and be hit. Utilizing a Zweihander or fire-based weapon, can also help you deal more damage and finish the fight quicker, to avoid poison build-up. If you are finding it hard to engage in a mano-a-mano, you can head back to the Butcher's kitchen and drop down the hole behind her table to land on a ledge above the rat. From here you can make quick work of the Giant Rat, using fire and lightning based pyromancies, miracles, and weapons to speed the process up. There is another way to kill this rat without ever confronting it in battle. Moving through the Depths to the bonfire that's behind the Torch Hollow. If you exit that bonfire room, turn down the right and continue along the path into a room where you can break some boxes and drop down into a cage, with the bars separating you from the giant rodent. The top of the bars have a small section where ranged weapons, spells and even long ranged melee weapons can hit him, allowing for an easy kill. However, if you use a bonfire or die before getting his drop, it will disappear.